Upon being given the chance to share the 10 things that define me, that exemplify what I’m all about, that impart to others who I am as a person in this big wide world, I took a deep breath and held it in. Where, oh where, to begin? My apartment, which has been dubbed as the “Trinket Kingdom” is full to the brim with odds and ends that I have collected over the years. Everything from furniture to electronics, hand-crafted painted wooden mirrors to oriental rugs, utensils to torn-off corners of cast-away decadent paper I came across when passing a recycling bin (snagged it for art projects). You name it, I’ve got it. And to narrow down my things to just 10? Seemed like a daring task. As Regina said, this list may – and likely will – change. It may grow, it might contract, it could explode and turn into something completely different. My “style” might change as the years go on, and as I expand my repertoire of things, of people, of feelings, of experiences, of memories. But for now, here are the 10 (in no particular order) that showcase who I am as of today. Indian beaded necklace. 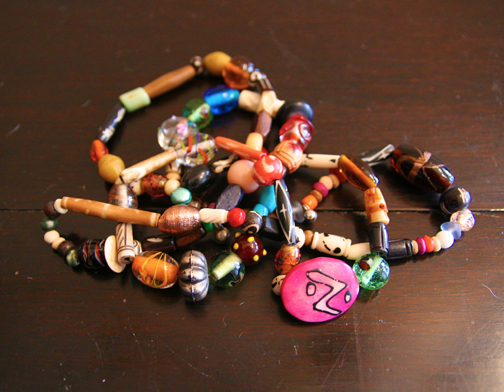 I purchased this necklace in summer 2006 in Pushkar, northwest India. Everytime I wear it, it sparks conversation. It represents my natural tendency towards all things eclectic. Made of 107 beads, its diversity – no bead is the same, all are unique – is fascinating to me. Its colors are radiant, and as a possession, it’s one-of-a-kind. Wooden giraffe. I think sometime in the 6th grade I convinced myself that giraffes were my favorite animal. I’ve stayed true to my convictions, even many years later. 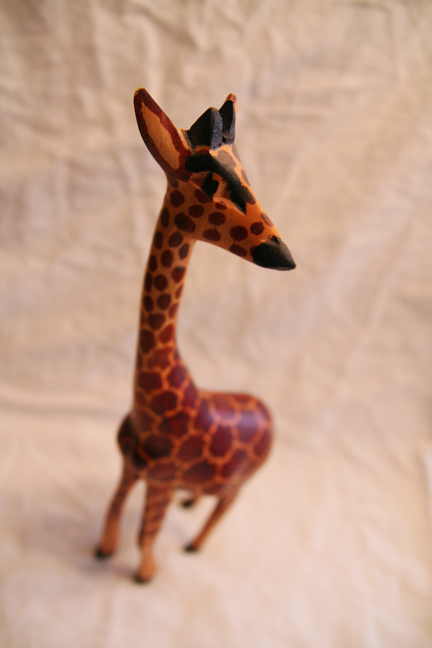 This wooden giraffe is one of my most coveted of the collection. At one foot tall, its wooden legs tower over the others (I have 25 or so giraffes in the collection). Somehow, the giraffe is lean, fierce, elegant and stoic all at the same time. Its left ear is chipped, which gives it more character; it shows wear and tear (I’ve dragged this figurine with me to homes in three different states). It lives as a centerpiece on my mantel. Notebooks. For some time, I thought I’d never go back to freehand, having gotten used to typing everything on my computer. 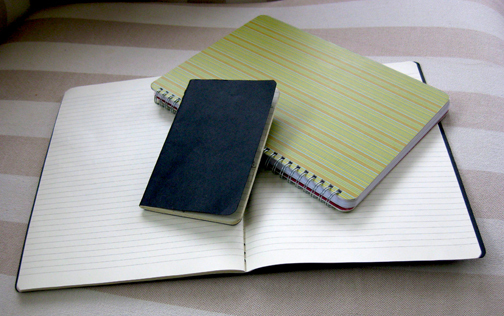 However, every time I flip open a notebook to a blank page, I feel invigorated. I desperately want to fill that space. To organize myself on paper. To physically and tangibly cross (etch, rather!) things off of my “To Do” list. There is something so personal, so human, so basic and rudimentary about the act of writing by pen or pencil. 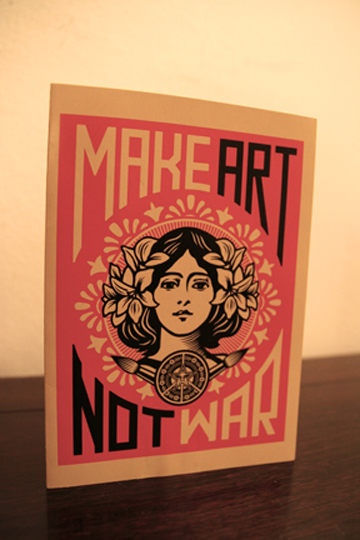 Make Art Not War postcard. I snagged this postcard at some cute boutique in Noe Valley, SF. It’s been the centerpiece of my art studio ever since then. Designed by a RISD graduate, Shepard Fairey (who also designed the Barack Obama “HOPE” poster, as well as the Obey Giant logo). I don’t know what I love most about this postcard – the stenciling or the message. Together, they make the perfect image. Antique Indian blanket. This blanket was a gift to me from a friend’s grandmother. She got hold of it in the 1960s when traveling in India. She brought it, and three others like it (which were also graciously imparted to me), home with her. Decades later, she passed them onto me. For some reason – and I have yet to put my finger on it – this is one of the few things (inanimate objects) I would save if disaster hit and I could choose a few things to salvage. I’m not sure why; it’s become one of my favorite belongings. 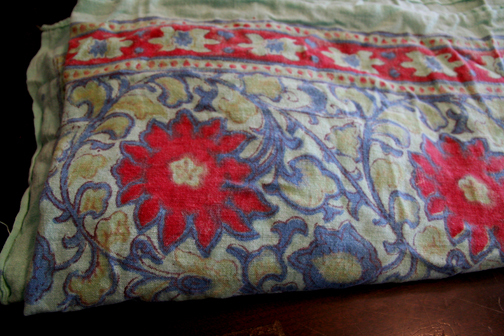 It’s a gift; it’s vintage; it’s colorful but beautifully and naturally faded; it’s versatile. Cactus. I felt compelled to add what I call my “cactus family” to the list of 10 things. These cacti are relatively new to my “cactus family” as I purchased them just last August. My first – and oldest – cactus lives at my childhood home in Seattle. I got it when I was a mere 2nd grader, just 7 years old. To think! That cactus is getting old. It was given to me by my father’s longtime neighborhood buddy, who had a cactus that had spawned a bud. He gave that bud to me. 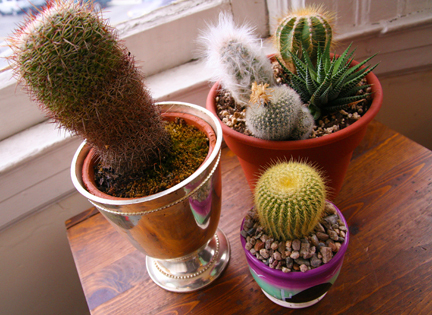 Cacti, although prickly, give me a sense of “home,” of familiar sights and memories. African mask. This mask and wall hanging was given to me by a Sudanese refugee living in Cairo, Egypt (where I studied and worked abroad). It is made of bits and pieces of cloth, wires, beads, string and other recycled material. I love its texture, how raw the materials are yet how manipulated they are, too. It represents my larger appreciation for recycled art and for mixed-media sculptures. I enjoy refined art, but I appreciate and admire DIY pieces such as this. Plus, this object comes with a story of another person, another time, another place. Ikea Expedit shelf. Okay, okay. I was going to try to steer clear of mainstream objects – especially those from IKEA! – but this one *had* to make the list. 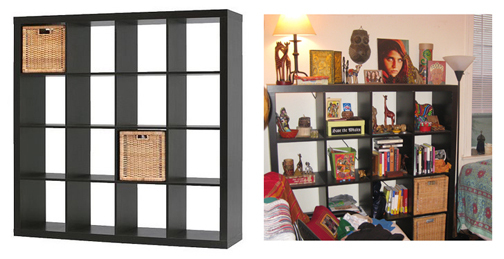 The 4×4 Ikea Expedit Shelf is a staple in my home. I cannot express how much I love this item. It is so simple, so straight, but allows for endless customization, organization and experimentation. I’ve added “before” and “after” images so you can get a sense of how I “play” with this staple furniture piece in my own home. 13-inch MacBook. 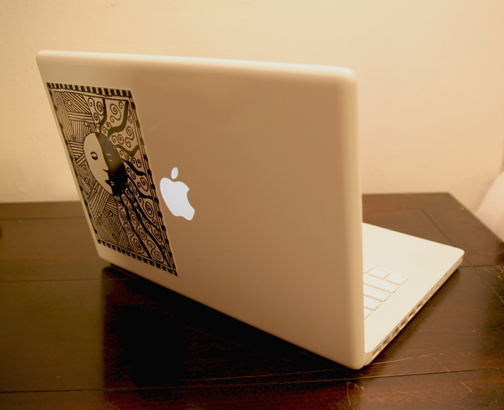 I had to add my MacBook, as it’s difficult to live without. Internet went out today and I didn’t know what to do with myself. How connected we are these days to the digital and tech world. This computer is small, relatively lightweight, has great features and interface. Works like a charm. It makes doing work enjoyable. I’ve even personalized the front shell with a drawing of my own, the shell looked lonely! Words to live by, from Mom. On my first day of college, my mother (a calligraphist back in the day) gave me these three little picture frames, with her words to live by and her good wishes to me as I embarked on a new adventure. I’ve kept them since, displaying them close to my favorite spots in the house – my nightstand and my art studio. They have lived through many trips, as you can see from the Scotch tape on the sides of the frames. Words she has lived by, words that I live by still today. This entry was posted in What defines you? and tagged Collecting, define, favorite, objects, things, What defines you?. Bookmark the permalink.